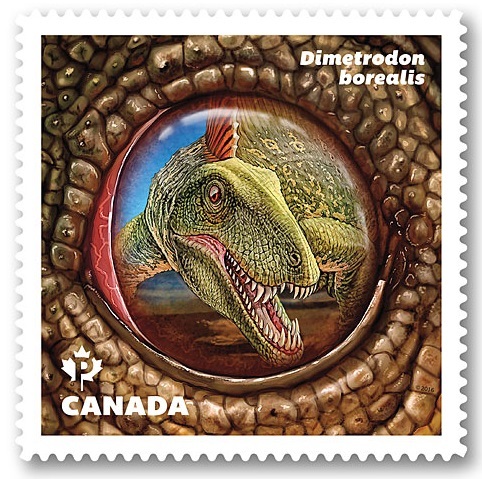 On May 26, Canadian Post Authority issued the second set of dinosaur stamps. Similar to the first issue (2015) this one also contain Mini-Sheet of 5 stamps, Booklet with 10 self adhesive stamps and uncut sheet with 7 mini-sheets. The stylish stamps depict each animal as a reflection in the eye of a predator or in the eye of one of their own species. 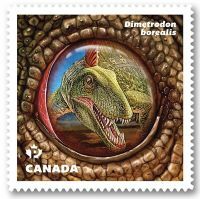 "We work with experts in the field from the Canadian Museum of Nature to select dinosaurs that have been discovered in Canada," said Canada Post's media manager Phil Legault. 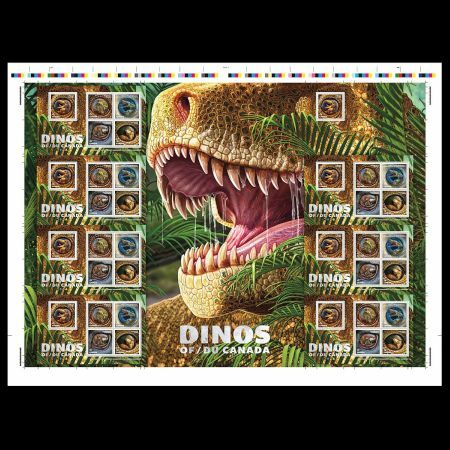 "As with most stamp sets, we also try to select dinos that would make the most stunning and interesting images and represent as many different regions of Canada as possible". 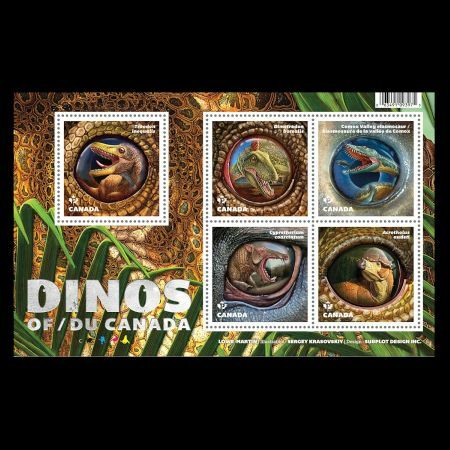 Even though the set name is "Dinosaurs of Canada", not all of the prehistoric animals featured on this year’s stamps are actually dinosaurs, but 2 fit the bill. The first is Acrotholus audeti, which roamed Alberta’s Badlands about 84 million years ago. The second, the small, feathered Troodon inequalis, inhabited the same area some 9 million years later. 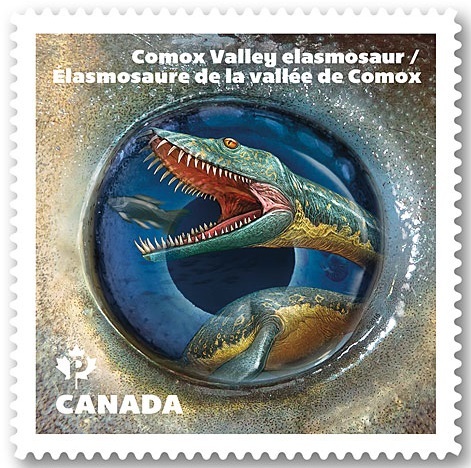 The creatures on the 3 remaining stamps are: the Comox Valley Elasmosaur is plesiosaurus (marine reptilie) hunted in the waters off what is now Vancouver Island (British Columbia) more than 80 million years ago. Cypretherium coarctatum nicknamed “Terminator Pig”, bared its menacing teeth to stalk prey on the floodplains of Saskatchewan some 35 million years ago. 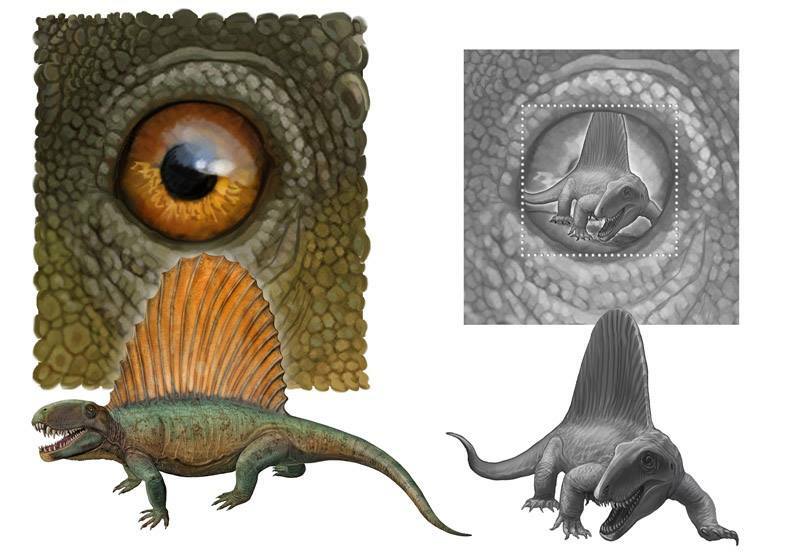 Finally, Dimetrodon borealis mammal-like reptiles lived on the arid landscape of Prince Edward Island about 270 million years ago and went extinct some 40 million years before the dinosaurs. 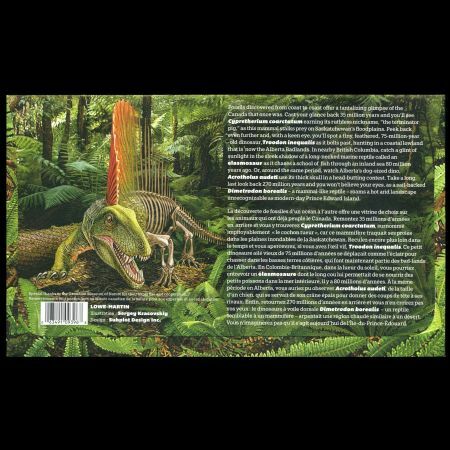 A stylized Dimetrodon, half living creature and half bony skeleton, roams a ferny forest on the booklet’s front cover. 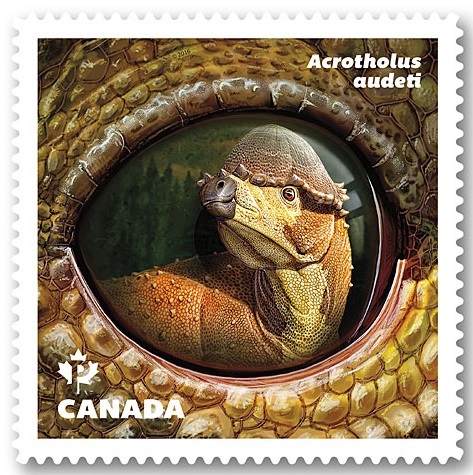 Acrotholus is an extinct genus of fully domed pachycephalosaurid dinosaur known from the Late Cretaceous Deadhorse Coulee Member of the Milk River Formation (latest Santonian stage) of southern Alberta, Canada. It contains a single species, Acrotholus audeti. Acrotholus means ‘high dome,’ referring to its dome-shaped skull, which is composed of solid bone over 10 cm thick. The species name ‘audeti’ honors Alberta rancher Roy Audet, on whose land the best specimen was discovered in 2008. According to the scientists, Acrotholus represents the oldest bone-headed dinosaur in North America, and possibly the world. 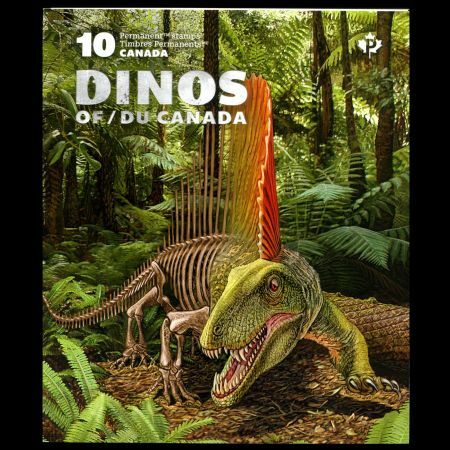 The dinosaur walked on two legs and had a greatly thickened, domed skull above its eyes, which was used for display to other members of its species, and may have also been used in head-butting contests. 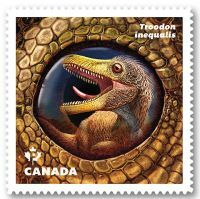 Troodon is a genus of relatively small, bird-like dinosaurs known definitively from the Campanian age of the Cretaceous period (about 77 mya), though possible additional species are known from later in the Campanian and also from the early Maastrichtian age. 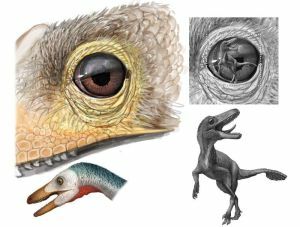 It includes at least one species, Troodon formosus, though many fossils, possibly representing several species have been classified in this genus. These species ranged widely, with fossil remains recovered from as far north as Alaska and as far south as Wyoming and even possibly Texas and New Mexico. 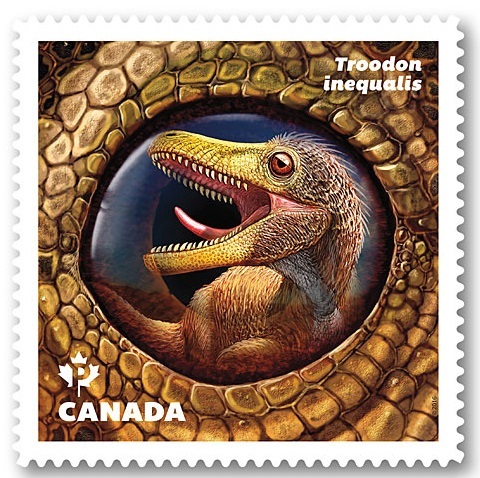 Discovered in 1855, T. formosus was among the first dinosaurs found in North America. The genus name is Greek for "wounding tooth", referring to the teeth, which were different from those of most other theropods known at the time of their discovery. The teeth bear prominent, apically oriented serrations. 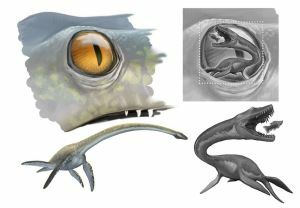 These "wounding" serrations, however, are morphometrically more similar to those of herbivorous reptiles, and suggest a possibly omnivorous diet. 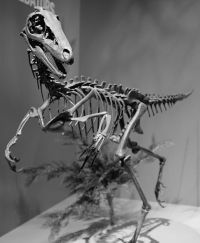 A partial Troodon skeleton has been discovered with preserved puncture marks. Elasmosaurus is a genus of plesiosaur with an extremely long neck that lived in the Late Cretaceous period , 80.5 million years ago. "The Elasmosaur, whose fossil is displayed in the Courtenay and District Museum and Paleontology Centre, along with a full-sized replica that hangs from the ceiling, was discovered in the fall of 1988. 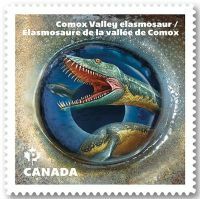 It was the first Elasmosaur recorded in British Columbia — the first of its kind west of the Canadian Rockies. Local resident Mike Trask and his 12-year-old daughter Heather were out prospecting for fossils along the Puntledge River just west of the city. 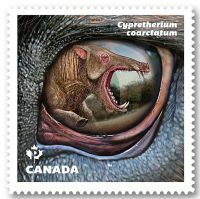 Cypretherium coarctatum is an extinct entelodont from the Chadronian strata of the Cypress Hills Formation in Saskatchewan. 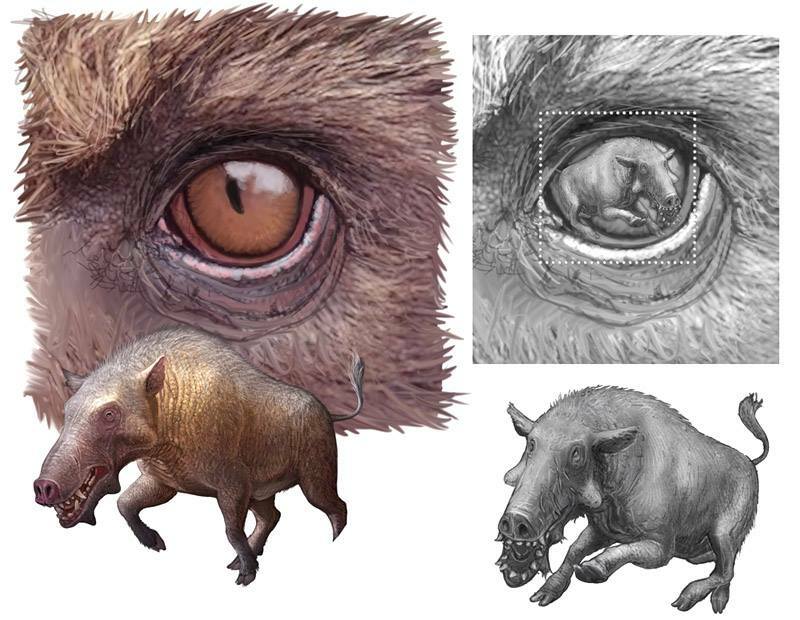 Entelodonts sometimes facetiously termed hell pigs or terminator pigs are an extinct family of pig-like omnivores of the forests and plains of North America, Europe, and Asia from the middle Eocene to early Miocene epochs (37.2—16.3 million years ago), existing for about 21 million years. Entelodonts lived in the forests and plains where they were the apex predators, consuming carrion and live animals and rounding off their diets with plants and tubers. They would have hunted large animals, dispatching them with a bite from their jaws. 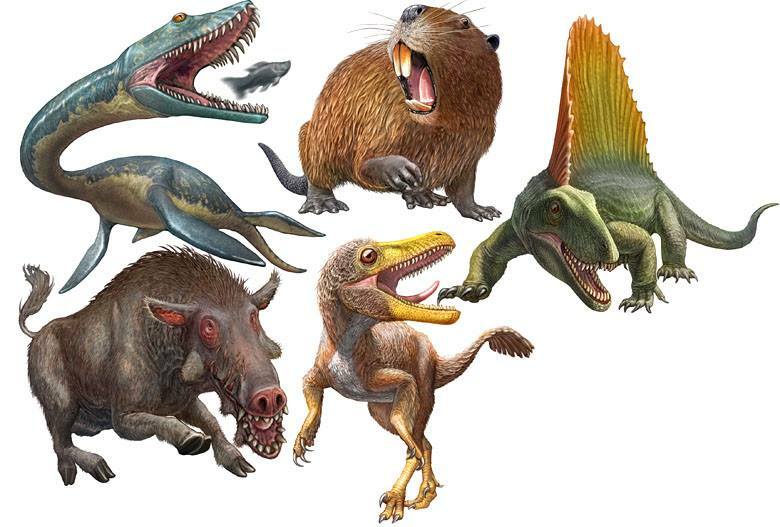 Some fossil remains of these other animals have been found with the bite marks of entelodonts on them. Like modern-day pigs, they were omnivores, eating both meat and plants, but their adaptations show a bias towards live prey and carrion. They were most likely opportunists, mainly eating live animals, but not rejecting carrion and roots and tubers in times of drought. .
Dimetrodon borealis, formerly known as Bathygnathus borealis, is an extinct mammal-like reptiles that walked on four legs and were known primarily for their large "sails," which arced along their spines. The creatures were top predators in the early Premian era, between 295 and 272 million years ago, and went extinct some 40 million years before the dinosaurs.Dimetrodons are often mistaken for dinosaurs but are actually more closely related to mammals. A partial skull bone from Prince Edward Island in Canada is the only known fossil of Bathygnathus. The skull was discovered around 1845 during the course of a well excavation in Spring Brook in the New London area. 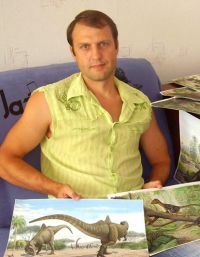 and Liz Wurzinger, while the actual illustrations are being done by Ukraine-based professional artist Sergey Krasovskiy, who is well known for his dinosaur paintings. 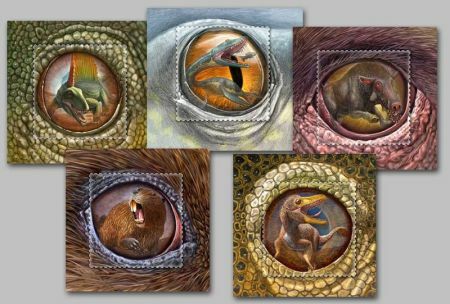 Steph Gibson came up with the idea of showing the reflection of the creature through the eyes of another. Each eye is a unique frame, so it helps to create an interesting storyline for the stamp. Who’s watching? Predator? Prey? They inspire the imagination without having to depict an entire scene,” says Roy White. "I looked at extreme close-ups of reflections in real eyes, so I could replicate the look with realism" says Sergey Krasovskiy. Here are some sketches provided by the illustrator, Sergey Krasovskiy. On the beginning of his work Castoroides giant beaver (extinct genus of enormous beavers that lived in North America during the Pleistocene) was planed. 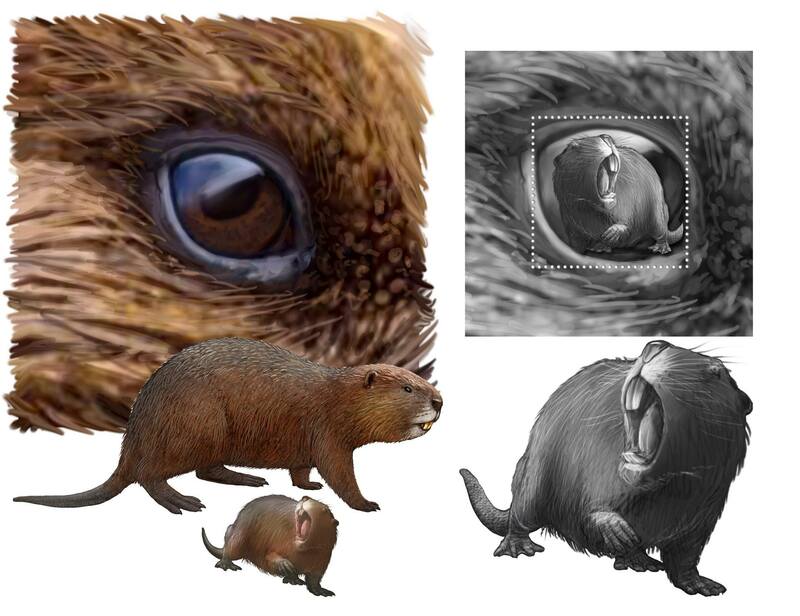 Later on the "beaver" replaced by Acrotholus. 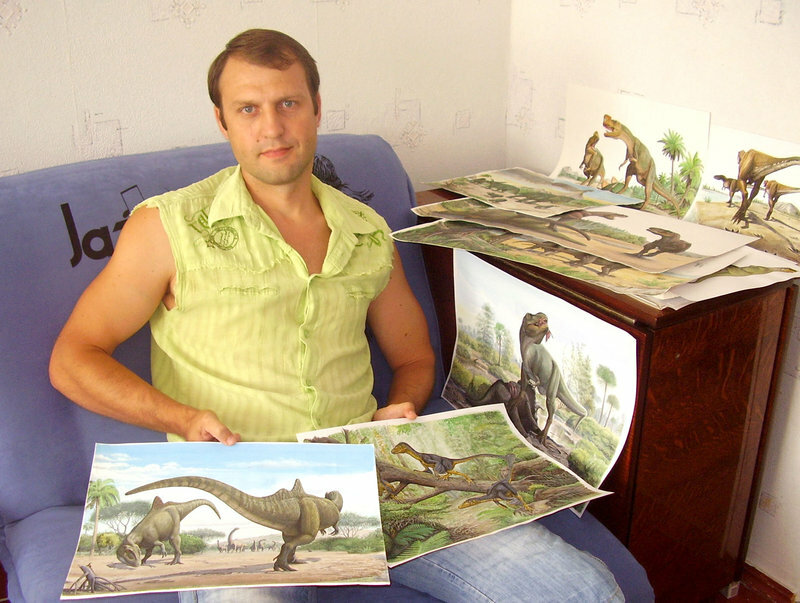 On the beginning of his work, Sergey drawn the animals itself. 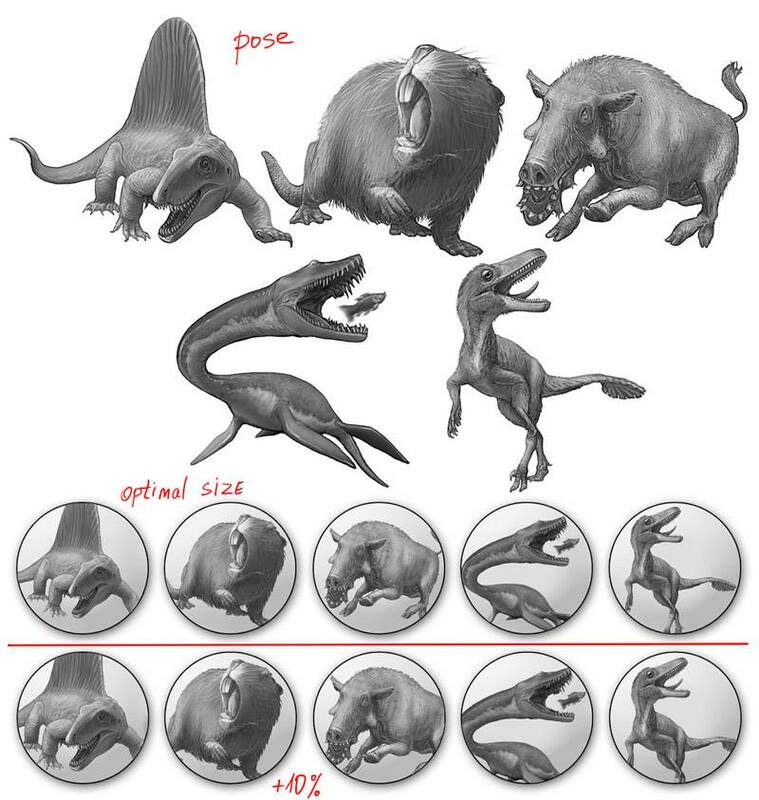 First just grey forms, later on in color. The next step was to draw eyes and the animals inside. Finally Acrotholus was depicted on stamp instead of the gigant beaver. After many Skype calls an images exchange, illustrations for Canada's Post are finalize. 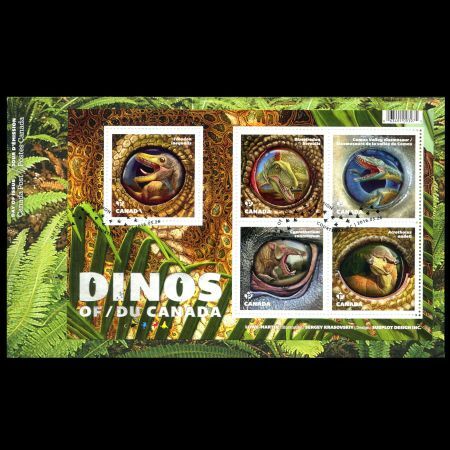 The stamps are cancelled with a pictorial cancellation of dinosaur footprints. 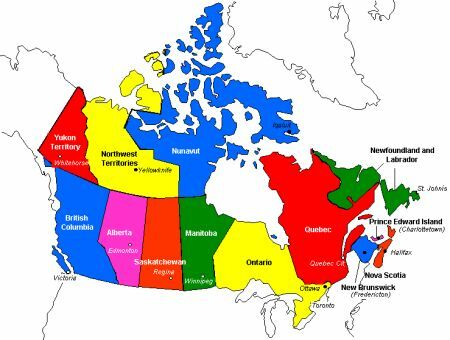 The cancel location is Courtenay, British Columbia. 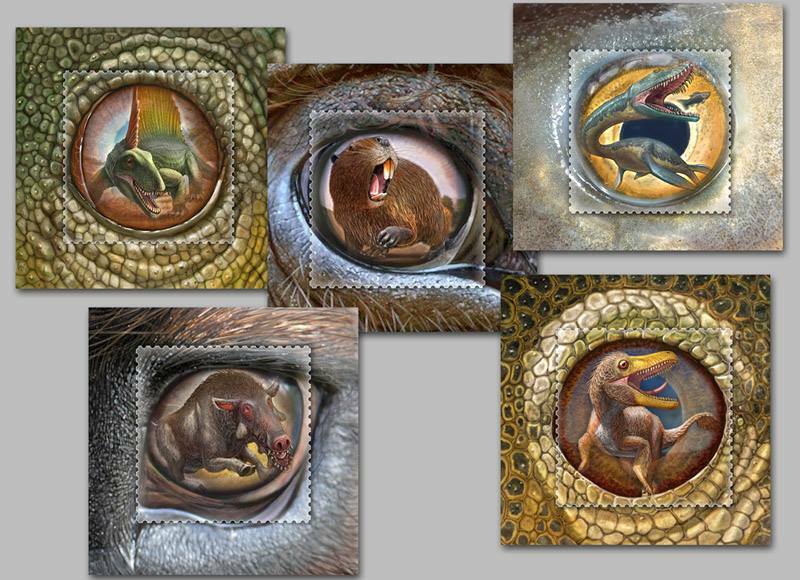 Acknowledge: Many thanks to Mr. Sergey Krasovskiy, the illustrator of these stamps for very nice conversation on facebook and for share his sketches.